We all know that sugar, in the form of things candy, pop and other sweets, can do a lot of damage to children’s teeth. But there are hidden sugars lurking in some unexpected places; here are just a few. Fruit juices contain lots of healthy vitamins and minerals, but they also typically contain a lot of sugar. In fact, often there’s not much difference between drinking a glass of juice and drinking a glass of pop, or eating a candy bar. Plus, fruit juices also contain enamel-softening acids. 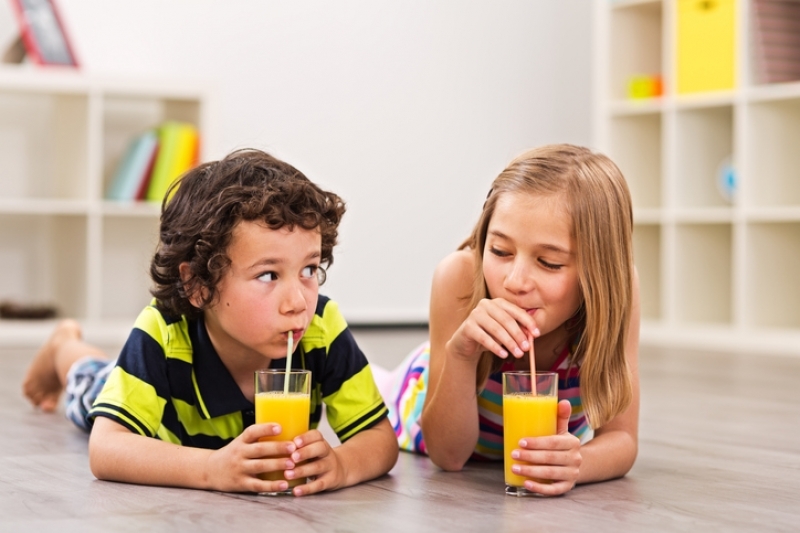 Straws can help prevent the juice from coming into direct contact with the teeth, so give your child a straw through which to sip her juice. Then, have her brush her teeth – but not straight after drinking the juice! Wait about 45 minutes first, so that the softening effects of the acids have a chance to wear off. Chewable vitamins are fun for kids because they have the same taste and texture as gummy bears. Unfortunately, they’re not that different in terms of sugar content, either. In fact, gummy candies (chewable vitamins included) have a way of sticking to teeth, and this allows sugar eating bacteria to grow, eventually leading to decay. If your child needs to take vitamins, administer them in pill form. You may also want work on helping your child develop a more balanced diet rich in fruits and veggies (not always easy, we know) so that vitamin supplements are rendered unnecessary. Next time you visit the grocery store, look at the ingredients list on a few cans and jars of food you sometimes buy. You may be surprised to find that they contain sugar – in some cases, quite a lot! Most processed and pre-packaged foods do contain sugar, and while it's fine to eat them occasionally, making them a regular staple may eventually cause damage to your family's teeth. Eat pre-packaged foods in moderation and make dinner from scratch as often as you can. And if possible, try gettingyour kids to help out with dinner! This may have the added benefits of getting them interested in their oral health, and expanding their palettes and the foods they’re willing to eat. If you have questions about diet and nutrition as it relates to dental health, take a look at our Health & Nutrition Blog, or get in touch with our Smile Town North Delta Children’s dentists today!